Sequester. Sequester. Sequester. Sequester. Sequester. There, the word is now meaningless. There’s a linguistic term for this effect: semantic satiation. Supposedly it’s only temporary, so we may in time retrieve the proper use of the word. Good thing, too, because its current usage both is incorrect and has overtaken its use as an important environmental concept. First, the incorrect part. The word sequester has several related meanings: to set apart, as in sequester a jury; to legally seize, as in hold until a law or court order is complied with; to place in custody. Note that, in all those cases, the sequestration is temporary (as, oddly enough, is semantic satiation). That would mean that the items sequestered from the federal budget are to be returned when (if?) the government gets its act together enough to, er, govern. But I’m not concerned with that misappropriation (pun intended) of the word. My objection has to do with its prior usage in the context of the environment and climate change. The word is used there to refer to sequestering carbon, as in temporarily removing it from the atmosphere. It’s the reason tree planting is often an integral part of fighting climate change; trees draw carbon (in the form of CO2) from the atmosphere and convert it to oxygen while retaining the carbon in the tree’s cells. So we refer to plants in general and trees especially as carbon sequesterers. The fewer forests we have, the less CO2 is absorbed. And burning trees or forests re-releases the carbon back into the atmosphere. Fossil fuels are also carbon sequesterers since they are composed of the remains of ancient animals and plants (which are, of course, carbon based). Burn that fuel, and all the carbon that’s been stored there for millennia goes into the atmosphere. The other great natural carbon sequesterers (or “carbon dumps”) are the oceans. They currently absorb a huge percentage of both natural and anthropogenic emissions of carbon dioxide into the atmosphere, and they can continue to absorb more. And there are proposals to increase, via geoengineering, the amount of carbon stored in the oceans. Problem is: the oceans’ chemistry changes as more carbon is absorbed, and mucking with ecosystems that are so fundamental to the planet’s workings carries the potential of unforeseeable risks. 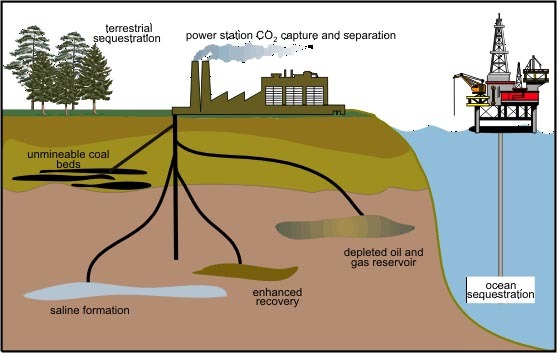 There are other methods of carbon sequestration, often referred to these days as carbon capture and storage or CSS. Storing it underground, perhaps in large natural geological caverns (or ones left over after drilling operations), is one such suggestion. But this brings us back to my initial problem with the current use of the word sequester: that a sequester is temporary. At best, carbon sequestration merely defers the problem to later generations, assuming the oceans can handle it or our underground storage systems don’t leak. At worst, it deceives us into thinking we can continue emitting carbon as we currently do (or emit increasing amounts). Were the budget sequester actually a sequester, it too would just be kicking the bucket down the road in that the funds would be restored at some (presumably near) future point. I’ll leave it Washington pundits to discuss whether that would be better or worse than the sequester we’ve got. But in its environmental usage, carbon sequestration, except perhaps in the case of reforestation, is not a solution. It’s only a temporary mitigation. And that’s if it works according to plan. This entry was posted in Politics and tagged fossil fuels, geoengineering, sequester, Sequestration on March 5, 2013 by David Bergman.